This page describes the northernmost section of the famous via delle Bocchette. The via delle Bocchette is a more-or-less level high-altitude route that runs along partway up the high peaks of the Brenta Dolomites (The Brenta Dolomites are a separate sub-group of the main dolomites). The ferrata itself offers good scenery and a bit more solitude than the higher, more exciting portions of the Via delle Bocchette further south. The climbing is not very difficult, nor is there very much actual ferrata. There is some exposed ledgewalking. The 'meat' of the ferrata is concentrated at the southern end, near the Bocca del Tuckett. 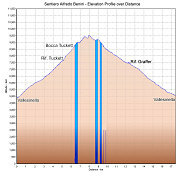 This route is described in a counter-clockwise direction, starting at the upper Vallesinella parking lot, ascending trail 317 to the Rifugio Tuckett, then to the Bocca del Tuckett, then north along the sentiero Benini to Rifugio Graffer, and then back down to the Vallesinella parking lot via trail 382. Starting off from the parking area, walk through the log-cabiin like Adamello-Brenta entrance building. Trail 317 starts by going through this building. The trail is wide and well-maintained as it leads up through forest to Rifugio Casinei. At the Rifugio Casinei is a trail junction. Stay left on trail 317, which heads towards Rifugio Tuckett. The trail starts to emerge into the open as you near the rifugio, revealing the beauty of the Brenta Massif before you and of the scenic Rifugio Tuckett. Above the Rifugio Tuckett, take trail 303, which leads steeply up to Bocca del Tuckett, a pass in the main north-south Brenta Range. 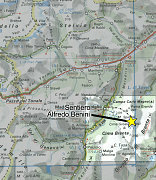 The start of the Sentiero Benini is in this pass. This pass is also the northern end of the Sentiero Bocchette Alte, another section of the Via delle Bocchette (click here if you want to read about that route). The Sentiero Benini route starts off steeply, with ladders and wire, and quickly rises far above the Bocca del Tuckett. There are excellent views south to the Cima Brenta and other big Brenta peaks, along with high pocket glaciers. Soon the wire ends (and this is the end of the biggest ferrata sections), and the route continues north, passing a junction with an alternate trail down to Rifugio Tuckett. Following trail 305 waymarks, the route climbs higher and swings east, crossing the main north-south spine of the Brenta at an elevation of about 9,500 feet. This is the highest point on the route. For the next while, the route remains on the east side of the Brenta Massif. Once over the pass, the trail swings north and traverses midway on ledges along big cliffs, contouring in and out as it goes. If the route is a bit more exposed, there are wires, and if not so exposed, there aren't. There are spots that are somewhat airy and that have no wires. After gradually descending, there is one short ferrata-protected climb, and then the ledge traversing continues, gradually descending. Another low point is reached, and then a bit of a rising traverse is followed by a big arc traversing along the face of the last big peak before Passo Groste (Cima Groste). After countouring around Cima Groste, you can see the large flattish terraced rock terrain of the Passo Groste. The route heads west, following sloping ledges, and eventually emerges onto the terraced rock terrain. When you arrive at the junction of trail 305 and 331, take 331 - this will bring you more directly down to Rifugio Graffer (and ultimately, your return route).